The thunderstorms that rumble across Earth's surface bringing startling flashes of lightning also produce a more mysterious burst of energy in the form of gamma rays. More of the strange flashes are now being detected thanks to recent improvements to a NASA satellite. The improved detection is also giving scientists a better idea of what causes the perplexing phenomenon. 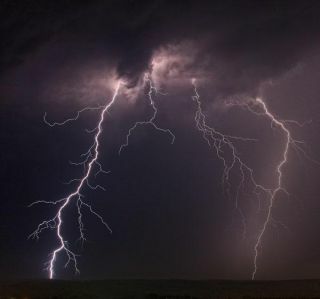 The high-energy outbursts that occur above thunderstorms are known as terrestrial gamma-ray flashes (TGFs) and they last only a few thousandths of a second. But even in that brief flash, they rank among the highest-energy forms of light that occur naturally on Earth, according to a NASA release. TGFs are detected from orbit by the Gamma-ray Burst Monitor (GBM) aboard NASA's Fermi Gamma-ray Space Telescope, which was recently upgraded and is now 10 times better at catching the phenomenon. Previously, the GBM only detected the brightest flashes, which would trigger its on-board system. The satellite spotted 601 TGFs between August 2008 and August 2011, with 409 of those coming from the use of the new technique. To learn more about what causes the gamma-ray flashes, the GBM team compared the new TGF data with signals of very low frequency (VLF) radio waves emitted by lightning (this is often heard as popping and crackling on an AM radio). Scientists had thought that the radio waves were emitted by strokes of lightning that were themselves somehow associated with the TGFs, according to the NASA release, but the GBM comparison found that the radio emissions occurred nearly simultaneously with the TGF, said team member Michael Briggs. The TGFs are thought to be generated by strong electrical fields at the top of thunderstorms. Certain conditions cause the fields to become strong enough that they send a rush of electrons upward, which then interact with air molecules and give off the gamma rays. That rush could also be the source of the radio emissions. "This gives us a new window into understanding this phenomenon," study team member Joseph Dwyer, a physics professor at the Florida Institute of Technology in Melbourne, Fla., said in a statement. The team hopes to use this relationship, along with new data from Fermi and lightning radio signals observed from Earth, to get a clearer picture of where TGFs occur and what kinds of storms produce them. Reach Andrea Thompson at athompson@techmedianetwork.com and follow her on twitter @AndreaTOAP.Follow OurAmazingPlanet on Twitter @OAPlanet. We're also on Facebook and Google+.